Taxi fare from the airport is about $20 and takes 10 minutes. There are usually plenty of cabs available in front of both the domestic and international terminals. If there is no cab in the rank there is a direct line phone to the cab company. The train and bus terminals are both in the CBD. 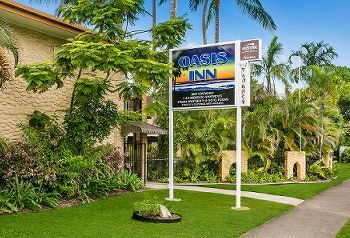 Get a cab for about $10 or take the bus either from Cairns Central (train station and shopping centre) or from the Lake Street terminal. Get bus 110, 111, 113, 120, or 121. Driver can make change. It costs $2.40.